When I purchased this polish I was stuck to decide a third polish to go with Fantasy Fire and Moon Dust and it was between Graffiti and Dazzling Blue. I decided to go for Dazzling Blue because it is a lighter shade of blue than graffiti and for that reason I thought I would get more use out of it throughout the summer months. To be perfectly honest this was the one that was theoretically free in the 3 for 2 deal so I wasn't expecting too much, but when applying this to my nails I fell in love with the colour and everything about this product, probably making it my favourite out of the three which I was not expecting. The consistency of the product was a bit thin so required a fair few coats to get an opaque finish, but unlike the other two products I found that it actually built a lot more, so the whole process didn't feel as laborious because you could see the product becoming more opaque. I think for the full coverage I used about 4 coats, which is quite a lot but the finish is pretty opaque so I am pleased with how it turned out. The colour is another thing that drew me to the product as the light blue was a colour that I hadn't seen before. It was only on closer inspection that I could see the different tones and shades of this product. In some lights it can look slightly more of a green or a light teal colour or in other lights a glint of light purple appears on your nails so in my opinion this is a very unique product. I know that many people are a little sceptical about blue nail varnish but I think in the summer it is the perfect time to wear a blue polish as a statement piece if its a vivid blue colour, but if not then this is more of a subtle alternative. Also this colour sort of reminds me of a mermaid kind of colour and for that reason with a tan on holiday I think this is a stunning colour to wear on the beach, by the pool or if you are staying at home even at a BBQ with friends and family. I would highly recommend this product and if you have a chance next time you are in Boots or Superdrug check out the MaxFactor section as I think these mini pots are the best way to try out new colours without having a massive bottle of a colour you only wear once in a blue moon stuck in your cupboard. Have you tried this colour? What do you think about blue polishes? 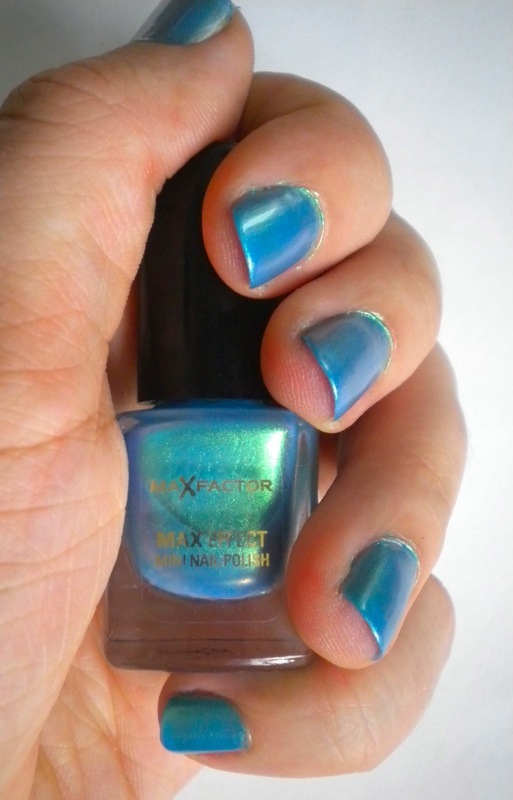 Whats your favourite MaxFactor mini polish and do you have any recommendations for ones that I can try out next.